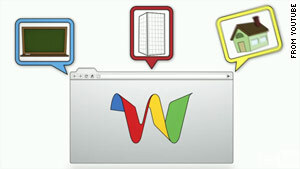 Google Wave aims to simplify Web communications. (Ars Technica) -- One year ago on May 28, Google launched its Wave collaboration tool to much fanfare. Initially open to just a handful of developers, Google eventually opened the service to a larger beta pool last fall. At that time, nearly everyone involved in tech was requesting or giving away Wave invites -- everybody wanted to try it. The limited availability of invites fueled a lot of hype, most of which seemed to fizzle after everyone who wanted an invite got one and many users wondered, "What's it for?" On Wave's anniversary last month, Google finally opened Wave to all comers. But the service still has a ways to go before it becomes a ubiquitous communication tool that users default to over e-mail, instant messaging, or other protocols. We spoke to Wave developer Lars Rasmussen to discuss what Wave is supposed to be and where it might go in the future. Rasmussen wrote up a pretty detailed explanation of the thinking behind Wave last year, but the short story is that our current modes of electronic communication have origins as far back as fifty years ago. E-mail has been around since some of the earliest shared computing systems, and was designed on the model of sending a paper letter. Instant messaging, whether in the form of IRC or AIM, is similarly decades old, and is more analogous to a phone conversation. Both of these protocols were attempts to improve upon already common forms of communication, but Rasmussen said that he and his brother thought there was plenty of room for improvement. "We were thinking of a way to, with digital means, improve conversations," he told Ars. Wave was a result of an attempt to develop the ultimate text-based communication tool. A whole Wave conversation is hosted in a central location, and everyone goes to that location to participate. Text can be sent and received in real-time, just like instant messaging, but the conversation is recorded for later reference, like an e-mail or forum thread. Wave also integrates widgets that allow embedding web content or images, and it lets users edit any part of the conversation, much like a wiki. It even makes a record of all the edits, like a wiki, and it's possible to go back at any point in time and see how things changed. "The first benefit is that you no longer need different tools for different types of conversation," Rasmussen said -- for example, IM for short conversations or e-mail for long ones. "Another benefit: everyone has a copy, everyone can always edit it, and everyone always has the latest updated information." But, Rasmussen told Ars, "one of our biggest challenges isn't so much explaining what a Wave is, but how it can change how you work." One decision early on in the design of Wave had to do with enabling real-time collaboration. As engineers, Rasmussen and the Wave team obsessed with optimizing and improving how fast messages would appear on Wave participants' screens. Ultimately, they decided to just let others view words as someone is typing. "This lets others start formulating answers as questions are being typed," Rasmssen explained. "It makes you feel like you are more directly interacting with others. You converge quicker to where it is you want to go with your work." One example Rasmussen shared was how the Wave team has adopted Wave to discuss and plan new features. When having such discussions via e-mail, replies don't happen in real-time, and it's possible that one e-mail leads one direction, while another response leads in another. Other team members may get added to the loop, while others might get left out. And extracting useful conclusions can involve going back though the entire thread. "Why not have the same place for collaboration and discussion?" Rasmussen opined. "The first part of a conversation can be a place to record the state of a discussion, for instance, and the final answer can be there as well," he said. Anyone joining the conversation can see the current state as summarized in the main "wave," while it's easy for anyone to go back through the conversation and see who said what, and when, or even look at the history of edits. "We use Wave to do everything related to Wave, like write blog posts, track bug progress, and generate design documents," Rasmussen said. Rasmussen believes that Wave is poised to enter the "slope of enlightenment" on the Gartner "hype cycle" -- a pattern said to describe how new, disruptive technologies mature and are adopted over time. "What we were showing last year was really early stuff," he explained. "We could have waited until it was totally done and then released it, but we wanted to get people excited about the technology." That early preview fueled plenty of hype, quickly pushing Wave to the "peak of inflated expectations." Unfortunately, Rasmussen said, "people were disappointed when it didn't change the world overnight." That's when Wave more or less plummeted into the "trough of disillusionment." But for the first six months, Wave was only open to select developers. For the last six months, it was open to a limited number of users. The implementation had plenty of bugs, and the team has constantly worked to improve it. Confident that its current state could prove useful to a wider audience, Google opened Wave to all comers during Google I/O. "People are starting to say recently that it's to a point where its useful," Rasmussen told Ars. "We still feel it has the opportunity to really change how we work and communicate remotely." So far, the most obvious and successful use case for Wave has been as a primary tool for group project management, much as Google is using it to manage Wave features. Any group writing project, for instance, can benefit from Wave's real-time interaction and automatic change tracking. But timelines and other sorts of project management also benefit as well. Google has highlighted several uses of collaborating with Wave, including using Wave to translate Latin poems or manage a technology conference. Our own Jon Stokes waxed hopeful that Wave could become a de facto tool for managing role playing games for remote groups of gamers. Rasmussen noted that much larger groups have used Wave to collaborate. The Seattle Times used a Wave to crowdsource details of a crime that resulted in the death of four police officers from over 300 readers in the community; the resulting article went on to win a Pulitzer Prize. Debatewise.org also use Wave to facilitate a student debate on climate change with over 1,000 students from more than 130 different countries last year. Rasmussen admitted that the performance of Wave can get bogged down when dealing with such large groups or Waves that have a large volumes of messages. However, the team is constantly working on optimizing and improving performance. Using the ability to embed a Wave into a webpage, some sites are using Wave as a live-blogging tool. As new use cases become popular, Rasmussen told Ars, "we'll be sure to put work into optimizing that use, too." Right now, though, smaller groups and teams working on projects is "the sweet spot," Rasmussen told Ars. Regular users say that Wave is "indispensable" for group collaboration, and it makes them "more productive." Beyond optimizing existing use cases, however, Rasmussen is even more excited about getting developers using APIs and other tools to build on Wave's underlying protocol. "There is an opportunity to build collaborative applications that can be built in top of Wave, bringing real-time collaboration for other kinds of use cases," he told Ars. "For example, mapping, editable mind-maps, collaborative drawing tools." Some examples of embracing that opportunity include Novell's Pulse and SAP's StreamWork enterprise collaboration tools. By supporting the Google Wave Federation Protocol, these tools can work with any wave server to enable remote collaboration. Salesforce.com has also built a toolkit to build applications that can connect Force.com users with Wave to collaborate "securely." But those tools just scratch the surface of what's possible. Like e-mail, IRC, AIM, VoIP, and other communications protocols, wide adoption happens when sophisticated and well-designed client applications are available. That hasn't happened yet for Wave, but there is a huge opportunity to integrate wave server support with a native client for Windows, Mac OS X, and Linux on the desktop, as well as mobile platforms like iOS (née iPhone OS), Android, webOS, and more. Like the proliferation of Twitter clients in that service's early days which bolted on support for URL shortening, image and video posting, and more the Wave protocol has the flexibility to expand collaboration with capabilities that even Google itself hasn't yet imagined. Perhaps when better tools are available, Wave will form a foundation for future communications -- much like decades after "electronic mail" first became possible on early time-share computing, it is now a form of communication that we collectively take for granted.